Joost van Schaik ran into a bit of a snag when playing around with Hololens. Read on to find out what he did to get it fixed. 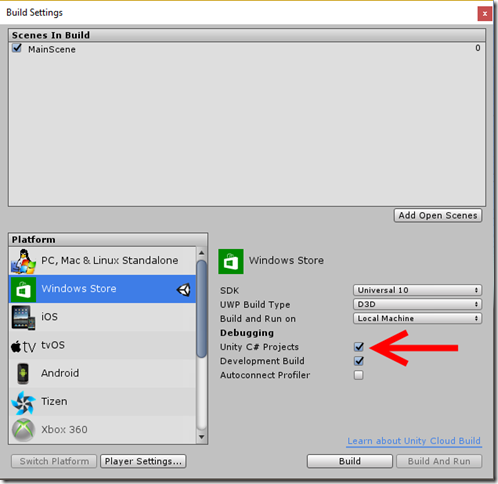 After following some on-line video’s and snooping through some other’s people code I felt I had to start bottom-up to get at least a feeling for how you setup a HoloLens app–even though I don’t have a HoloLens. Call it my natural curiosity. So I followed my fellow MVP Morten Nielsen’s blog–highly recommended–as he starts with the real basics. Very good if you hardly have a clue what you are doing. In his third post, I ran into a snag. According to his second post, I had unzipped the HoloLens toolkit into the assets folder as instructed and started to add occlusion to my project. Morten explains in detail what this is–it makes holograms disappear behind physical objects like a wall when they are ‘in front’ of the holograms (which, in reality, they never can be as they are projected on a screen not 2 inches from your eyes, but that is the magic of HoloLens). 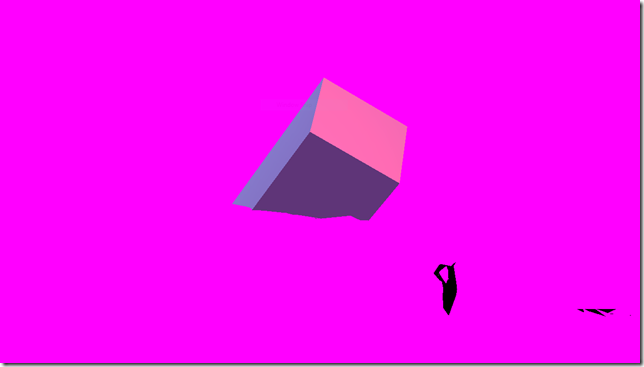 Yikes–that is my box all right, but where did that horrible magenta color come from? To this moment, I still don’t know, but I found out how to fix it. 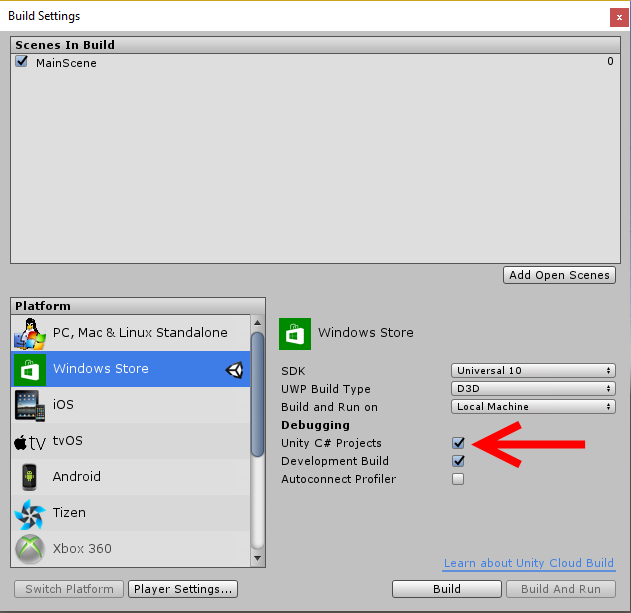 I do the “Development Build” as well, although I don’t really know if this is necessary. 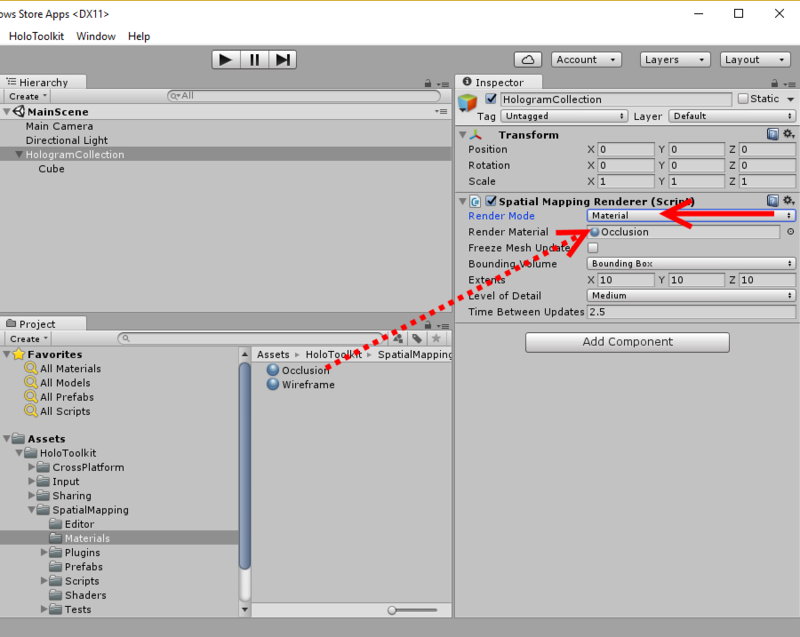 This makes all the scripts end up in your Visual Studio solution as well, and what is more, you can debug them. Thus I learned that the script “SpatialMappingRenderer.cs” (in folder Assets\HoloToolkit\SpatialMapping\Scripts\SpatialMappingComponent) looks for materials “Occlusion” and “WireFrame” that are clearly not there. If you debug this script (you can now thanks to the setting above) you will see both OcclusionMaterial and RenderingMaterial end up as null. 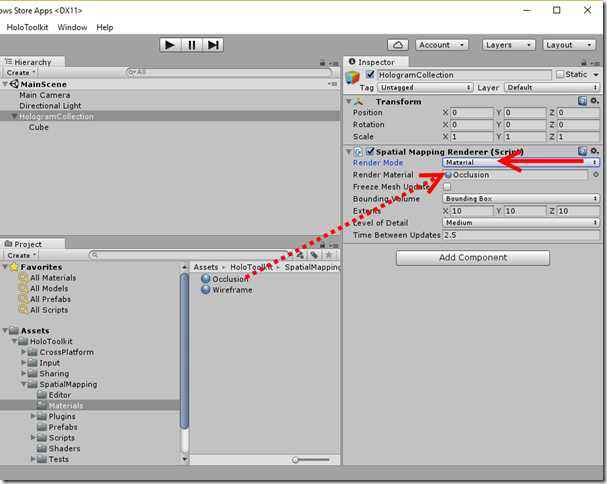 The materials are in HoloToolkit/SpatialMapping/Materials but changing “HoloToolkit” to “HoloToolkit/SpatialMapping/Materials” does not have any effect. So I went back to the Unity editor, selected the Spatial Mapping Renderer script again, changed the dropdown “Render mode” from “Occlusion” to “Material”, and that made the property “Render Material” pop up. I found the Occlusion Material on top of it, and it was accepted. Now I am seeing what I expect to see – a box sticking out of a wall. 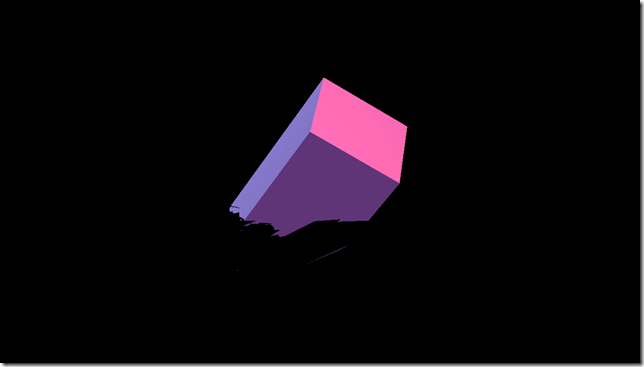 Disclaimer–I am just happily stumbling along trough Unity3D and HoloLens, not hampered by much knowledge of either. I found a problem (that I maybe caused myself) and I fixed it. I hope it helps someone. If I messed up, maybe someone can enlighten me. Unlike some other people, I am not afraid to look a n00b because in this case, that’s just what I am. The project itself can be found in a good old-fashioned ZIP file as I don’t want to clutter up my GitHub account with every little thing I try at this stage. I am still in the stage of ‘programming by changing things and observing their effects’, so I hope you will humor me. And maybe this will help someone, who knows.